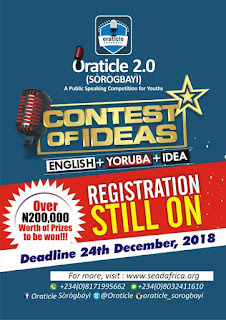 Oraticle (Sorogbayi) is an English and Yoruba public speaking competition among youths. Its major intent is the need to refocus the minds of young people towards bringing up solutions to manifest societal gaps and challenges rather than complain without results. English Language-our national mode of communication. years. PERSONS BELOW 18 WHO HAVE EXCEPTIONAL PROJECTS/IDEAS MAY BE CONSIDERED. ORATICLE is proposed to be conducted in English and Yoruba Languages. To preserve Yoruba Language as part of our culture and promote the use of English Language-our national mode of communication. *To be an avenue to educate a wider spectrum of people around the world about the sense of purpose, history, abundant human and natural resources; and developmental needs of our country. This project is an initiative of SEAD AFRICA. SEAD AFRICA is a business entity specialized in branding and printing solutions; idea creation; Social entrepreneurship, community development projects and consultancy. It has at its core, giving back to the society through its public awareness programmes, competitions, capacity building and training of young people. There is an ORATICLE TEAM saddled with the responsibility of overseeing this laudable initiative. The team members are carefully selected young people who have been involved in youth development programmes and projects for years. The ORATICLE JUDGES/FACULTY consist of young and adult professionals from diverse area of endeavours-all of who are credible hands and are poised to drive this noble cause with utmost sincerity and fairness. Do you have a great idea that can impact Osun State? Are you between 18-35 years? Or below 18 with an exceptional idea? Are you an indigene or resident of Osun? * Can you speak English and Yoruba fluently? 5. The best 15 entries will be shortlisted after 24th December, 2018 and be contacted for the grand finale ( Semi final and finals) holding in January 2019. This physical presentations will be done in English and Yoruba Languages. 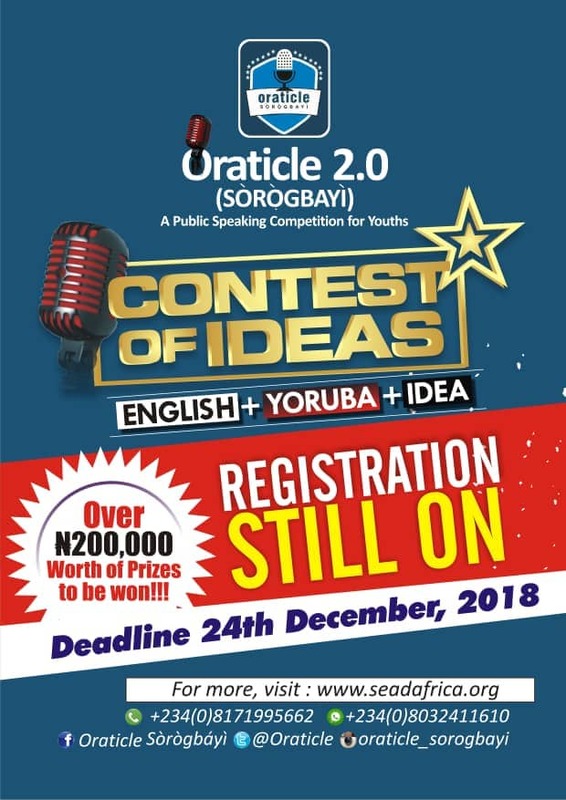 This edition-ORATICLE 2.0-would focus on young people presenting an idea or project focused on creating solution or opportunities within Osun State. To be an avenue to educate a wider spectrum of people around the world about the sense of purpose, history, abundant human and natural resources; and developmental needs of our country. Can you speak English and Yoruba fluently?